What is a good moveset for Spiritomb? If you have a good competitive moveset for Spiritomb, post an answer below and upvote the best ones. Movesets for its pre-evolutions, if any, can also be shared on this thread. Spiritomb Pokédex and learnset for reference. I'm done with moveset questions for today. I think I've passed my limit actually. Spiritomb Modest/Quiet Nature. EVs 252 HP, 252 Sp.Atk, 4 Def. Item Leftovers. Ability Pressure. Shadow Ball: Compliments other moves. Pain Split/Hidden Power Fighting: More coverage or healing while doing damage, works well on high hp walls like vaporeon. Oh~. Very nice. I like the set up. y would u give him leftovers? I find Infiltrator > Pressure. Yes it's good to mill down opponent's PP, but getting past subs and screens is better than PP milling for me. Even with Pain Split, Max HP is pretty much obligatory. It's still low enough to work well, and adds much greater bulk to it than some Def EVs. Is there a Gen 6 version of this? Training a Spiritomb in Gen 5 isn't my cup of tea. Trick's the Band onto the Foe, Confuses whoever switches in, or the foe if he's good with staying in, Or Sucker Punch / Shadow Sneak sweep with Dual STAB, you're pretty tankish with the EV's and no weaknesses. Spiritomb Quiet/Modest Nature. EVs 252 HP, 252 Sp.Atk, 4 Def. Ability Pressure. Item Leftovers. Dark Pulse/Shadow Ball depends on if you have trick room support, so does the nature. Psychic Gives coverage, nice move. Hidden Power Fighting works well with the dark/ghost type move as well as psychic. OR Switch the Attack EVs with SAtk EVs and a Modest/Quiet nature. I like the Adamant nature one better - the 60% accuracy of Hypnosis can be a game changer. Classic sleep talk set. CM a few times then rest off the damage, and sleep talk dark pulse away! That will be the set that i will use and image that beast with Ganlon Berry! Its gonna tank basically anything thrown at it while it Nasty Plots its way to a 4x or maxed S.Atk. Hypnosis: Gives you time to attack or raise stats, or heal pokemon. Impison: This is a HUGE advancement, since Spirtomb is a ghost type and ghost type moves are super effective on other ghost types this allows you to cancel out the opponents pokemon's same moves that have the same moves as you. Sucker Punch: STAB, good power, always attacks first. DO YOU EVEN KNOW WHAT STAB IS? Fyi spiritomb is a dark, ghost type which means that he gets half damage by ghosts due to his dark typing Times double damage by ghosts because of his ghost typing which means he takes normal damage from ghost, his only weakness is Fairies, hope this helped. Seeing as he has no weaknesses, I say he is a Wallin' BOSS. RestTalk if you think you are lucky and want to troll, Calm Mind and Psychic to be a good attacker. My take on the "Tricky Kill'sya" move set. Fair warning, this hasn't been play tested, just playing around with the set posted by Josh to work in Foul Play, which was added to Spiritomb's moveset via B2/W2 tutors. Trick gives your foe the choice band while swagger pumps up their attack stat as it confuses them, working the same way as confuse ray on a switch, but netting you a choice-banded swagger boosted STAB Foul Play on any bulky physical attacker that stays in thinking they can take you. Swagger works with Foul Play on the set, giving you a truly frightening stab against physical sweepers. Shadow Sneak rounds off the set, giving you a reliable priority STAB to use with Choice Band or to revenge kill confused foes. EVs have been reworked to give more physical bulk in case swagger backfires. A Defense increasing nature could also be chosen to increase survivability against a boosted physical attack, though it will likely cause noticeable reduction of damage output on the already weak Shadow Sneak. You could try swapping Shadow Sneak for Sucker Punch on this set (Since Dark and Ghost have very similar type coverage) to increase power, but it's less reliable. Infestation traps the opponent, WoW Burns them & cripples physical attackers, Snarl weakens special attackers & is STAB, the final slot goes to some type of healing or stalling move. So I play Pokemon Showdown. 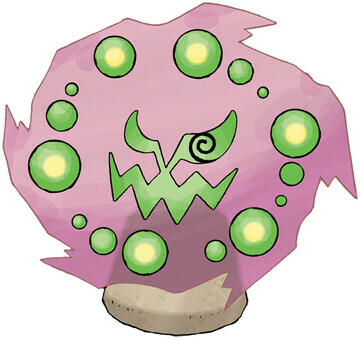 I think Spiritomb is a good sweeper for Halloween Party, or any ghost-type only battles. I swept with only Shadow Ball, but I'd Hypnosis first then Dream Eater. Later, Will-O-Wisp. And spam Shadow Ball. If the opponent uses Taunt (always for me), I just keep the Shadow Ball going. Hopefully, you can see where I'm going with this set. To start off, the zoom lens boosts hypnosis' accuracy, which is the main focal point of this set. Nasty Plot is for boosting your other moves as the opponent sleeps away. The other moves are for STAB. Also, the nature is for boosting the STAB moves' power, and the EVs are to further buff his already good Defense and Special Defense to make him a tank of sorts. Thing is, though, I never tested this set; I just used my imagination. Let me know of any issues you may find with this set; I'd greatly appreciate it! Thanks! Good physical set for spiritomb?